Apple Buys Dr. Dre's Beats Electronics For $3 Billion : The Two-Way Apple's acquisition of the audio equipment and subscription streaming music service co-founded by Dre and record-producer Jimmy Iovine is the computer-maker's largest-ever such purchase. 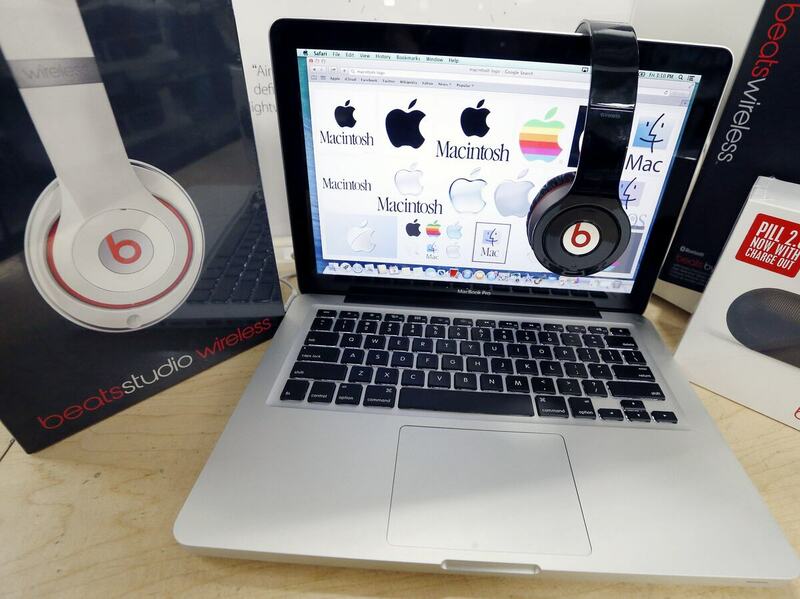 Apple announced Wednesday that it is acquiring Beats Electronics for $3 billion. Beats, the headphone and music streaming specialist, also brings the swagger of rapper Dr. Dre and recording impresario Jimmy Iovine. Apple announced Wednesday that it is acquiring Beats Electronics, agreeing to pay $3 billion for the audio equipment and subscription streaming music service founded by Dr. Dre and producer Jimmy Iovine. While it is relatively small in comparison with major acquisitions made by other tech companies, the deal represents the largest-ever for 38-year-old Apple. Beats co-founders Iovine and Dre will join Apple. Iovine said he'd always known in his heart that "Beats belonged with Apple. "The idea when we started the company was inspired by Apple's unmatched ability to marry culture and technology," he said in the statement. "Apple's deep commitment to music fans, artists, songwriters and the music industry is something special." Details of the deal had been leaked to the media three weeks ago. NPR's Elise Hu says, "In acquiring Beats, Apple is getting some top talent" with hip-hop artist and entrepreneur Dre and Iovine, a record company executive and music industry veteran, who are "joining Apple in unspecified executive roles." Cook said of the Beats co-founders, "We have known these guys forever." "We've dated, we've gone steady and now we are getting married," the Apple CEO said. "This relationship started a decade ago, so we know there is an incredible cultural fit. These two guys have a very rare set of skills. It's like finding a particular grain of sand on the beach. It's that rare." "The growing popularity of music streaming services such as Pandora and Spotify has been reducing sales of songs and albums, a business that iTunes has dominated for the past decade. U.S. sales of downloaded songs slipped 1 percent last year to $2.8 billion while streaming music revenue surged 39 percent to $1.4 billion, according to the Recording Industry Association of America."